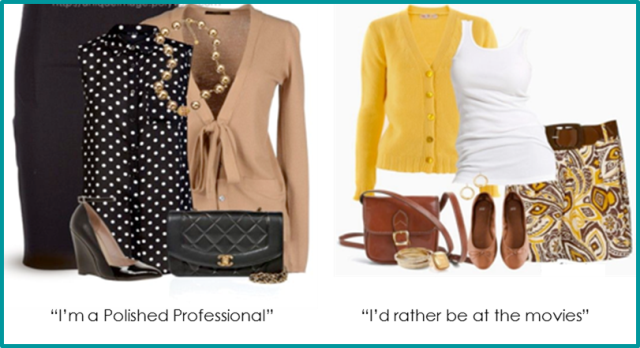 Ensure your outfit’s most prominent item is in a darker, neutral colour e.g. navy, charcoal, black blazer. The lighter the brighter the outfit the more casual you will look. So team up a turquoise shirt with a charcoal blazer. Colour has a profound influence not only on how smart you look but also how you feel – read on for the meaning of colours. If you are going to include a print in your outfit select a small pinstripe, or check rather than large, bold stripes, checks, and geometric patterns. You will appear smarter if you limit the amount and size of print on your outfit. Select a more tailored garment rather than anything too loose or flowing. Opt for a structured blazer as opposed to an unstructured jacket. Choose a pencil skirt rather than a flowing gypsy skirt. Purchase minimalistic, well tailored clothes that fit like you were born in them. The correct tailored jacket will instantly uplift your look. A ‘second layer” of some sort will do the trick too – a cardigan, sleeveless vest or waistcoat. Collared shirts are an uniform standard in most academic institutions and therefore associated with a level of “smartness”. A collared shirt will look smarter than a frilly blouse or crew neck top. Rather than selecting a thick, coarse very texturized fabric select a smooth, plain, no shine fabric. Stay away from fabrics that crease easily – you will look like an unmade bed! Keep the detail on your garments as plain as possible. So avoid a pair of pants that has a lot of zippers, turn-ups, pockets, buttons, etc. Rather select a plain flat front pair of pants. Keep these discreet and to a minimum. Don’t be known as the “gold medallion” guy or the “bling” girl from HR. Ensure your accessories match the level of your outfit – so a formal to smart outfit needs fine jewellery, discreet watches. 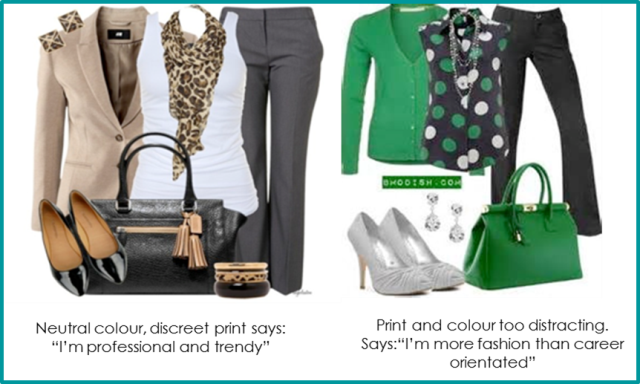 Smart casual outfits can be paired with bigger, bolder costume jewellery, bulky watches. Ladies to ensure you make the correct bag choice visit here. Rather have 3 pairs of good quality leather shoes than 250 cheap looking plastic shoes. To ensure you are putting your best shoe forward learns some key shoe strategies here. Beware the over-powering fragrance/after shave; chipped gothic nail polish; long nostril hair; brightly coloured hair streaks; five o clock shadow – these are all tell tale signs that you don’t pay attention to the detail of your brand and will make you appear unprofessional. By following these 11 steps you will come across as super-smart in no time.